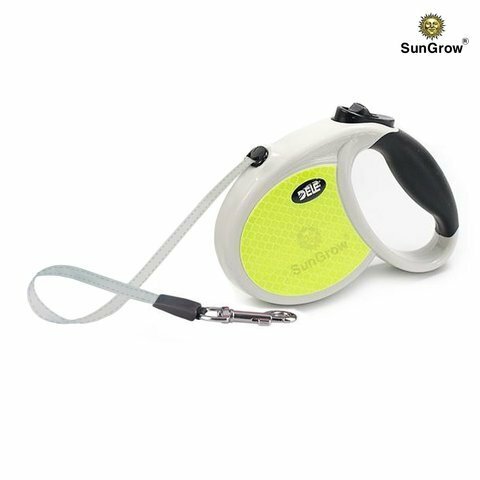 EASILY RETRACTABLE LEASH WITH COMFORTABLE GRIP --- SunGrow has brought you this incredible retractable and stretchable 2.5m neon dog mini leash that supports dogs weighing up to 22 lbs or less. Your Cavalier King Charles Spaniel, Pug, West Highland White Terrier and Papillon will have the utmost comfort and freedom. It\'s easy-to-use tape unrolls smoothly automatically and rolls back to the hook when not in use. Kids love it. EVEN KIDS CAN TAKE CONTROL --- With robust control pause/lock control feature, kids can easily take the dog on walk. It is designed keeping the traditional Chinese latch principle in mind. The stretchable/retractable feature makes the leash stable, comfortable and durable. The enhanced reflective polyester braid and the Pause/Lock feature combined keeps your dog in control, ALWAYS. Manual control is highly minimized with this contemporary leash. HIGH VISIBILITY EVEN IN DARK PLACES --- The casing is affixed with a bright neon yellow colored reflective film on both sides which ensures safety while trespassing in the dark. It is capable of reflecting headlights up to 150 yards away. While this leash is designed especially for kids, it\'s completely suitable for adults as well. MAKE YOUR PET HEALTHIER --- We all know that daily exercise is vital for dogs. So, walk your Bichon Frise, Havanese, Lhasa Apso, Scottish Terrier, and Cairn Terrier everyday with this easy-to-handle SunGrow Neon leash strapped on and keep him hearty and healthy at all times. ABLE TO WITHSTAND MAXIMUM PULLING FORCE --- Since the leash has reflective polyester braid, it can easily withstand the maximum pulling force of 30 kg. With that, you can ensure the pet traction within a predetermined range. Love this leash! It feels solid. I like the reflective leash and it also has reflective tape in the middle of the leash. The button is easy to press and release. I have a 15lb shih tzu and it's a perfect size for him!